Thornton JW. 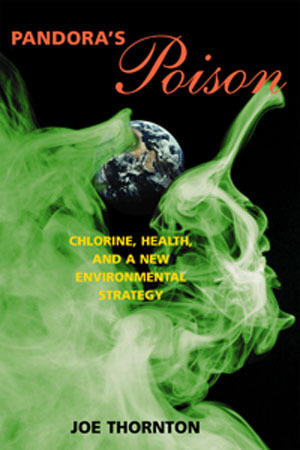 Pandora’s Poison: Chlorine, Health, and a New Environmental Strategy.MIT Press, 2001. Click on the book cover at right to read Terry Collins’ review in Nature, or the icon at left to go to the publisher’s site for the book. Click on the PDF icon to download a reprint. (Links still under construction.) Click on the icon at right to go to the paper at the journal’s website. Or go to Joe’s google scholar page. Liu Q, Onal P, Datta RR, Rogers JM, Schmidt-Ott U, Bulyk ML, Small S, Thornton JW. Ancient mechanisms for the evolution of the bicoid homeodomain’s function in fly development. Elife. 7:e34594, 2018. Siddiq MA, GKA Hochberg, JW Thornton. Evolution of protein specificity: insights from ancestral protein reconstruction. Current Opinion in Structural Biology, 47:113–122, 2017. GKA Hochberg, JW Thornton. Reconstructing Ancient Proteins to Understand the Causes of Structure and Function. Annual Review of Biophysics 46 (247-269), 2017. MA Siddiq, DW Loehlin, KL Montooth, JW Thornton. Experimental test and refutation of a classic case of molecular adaptation in Drosophila melanogaster. Nature Ecology & Evolution 1:25, 2017. TN Starr, JW Thornton. Exploring protein sequence-function landscapes. Nature Biotechnology 35 (2), 125-126, 2017. TN Starr, JW Thornton. Epistasis in protein evolution Protein Science 25 (7), 1204-1218 15, 2016. Anderson DP, Whitney DS, Hanson-Smith V, Woznica A, Campdonico-Burnett W, Volkman BF, King N, Thornton JW*, Prehoda KE* (2016). Evolution of an ancient protein function involved in organized multicellularity in animals. Elife, 5:e10147. Anderson DW, McKeown AN, Thornton JW (2015). Intermolecular epistasis shaped the function and evolution of an ancient transcription factor and its DNA binding sites. eLife 4:e07864, 2015. Y Katsu, PA Cziko, C Chandsawangbhuwana, JW Thornton, R Sato, Naker ME, Iguchi T. A second estrogen receptor from Japanese lamprey (Lethenteron japonicum) does not have activities for estrogen binding and transcription. General and Comparative Endocrinology 236, 105-114, 2016. Hudson WH, Kossman BR, deVera IMS, Chuob S-W, Weikuma ER, Eick GN, Thornton JW, Ivanov IN, Kojetin DJ, Ortlund EA (2015). Distal substitutions drive divergent DNA specificity among paralogous transcription factors through subdivision of conformational space. PNAS 113 (2):326-331, 2015. McKeown AN, Bridgham JT, Anderson DW, Murphy MN, Ortlund EA, Thornton JW (2014). Evolution of DNA specificity in a transcription factor family produced a new gene regulatory module. Cell 159(1):58-68. Hart KM, Harms MJ, Schmidt BH, Elya C, Thornton JW, Marqusee S (2014). Thermodynamic system drift in protein evolution. PLoS Biol. 12(11):e1001994, 2014. Harms MJ, Thornton JW (2014). Historical contingency and its biophysical basis in glucocorticoid receptor evolution. Nature 512:203-207, 2014. Bridgham JT, Keay J, Ortlund EA, Thornton JW (2014). Vestigialization of an allosteric switch: genetic and structural mechanisms for the evolution of constitutive activity in a steroid hormone receptor. PLoS Genet. 2014 Jan;10(1):e1004058. Harms MJ, Thornton JW (2013). Evolutionary biochemistry: revealing the historical and physical causes of protein properties. Nature Reviews Genetics 14: 559–571, 2013. Harms MJ, Eick GN, Goswami D, Colucci JK, Griffin PR, Ortlund EA, Thornton JW. (2013) Biophysical mechanisms for large-effect mutations in the evolution of steroid hormone receptors. Proceedings of the National Academy of Sciences USA 110:11475-11480, 2013. Eick GN, Colucci JK, Harms MJ, Orlund EA, Thornton JW (2012). Evolution of minimal specificity and promiscuity in steroid hormone receptors. PLOS Genetics 8(11): e1003072, 2012. Finnigan G, Hanson-Smith V, Stevens TH, Thornton JW (2012). Mechanisms for the evolution of increased complexity in a molecular machine. Nature 481:360-4, 2012, 2012. Carroll SM, Ortlund EA, Thornton JW (2011). Mechanisms for the Evolution of a Derived Function in the Ancestral Glucocorticoid Receptor. PLoS Genet 7(6): e1002117, 2011. Carroll SM, Thornton JW (2011). Lamprey endocrinology is not ancestral. Proceedings of the National Academy of Sciences USA 108(2):e5, 2011. Eick GN, Thornton JW (2011). Evolution of steroid receptors from an estrogen-sensitive ancestral receptor. Molecular and Cellular Endocrinology 334(1-2):31-37, 2011. Bridgham JT, Eick G, Larroux C, Deshpande K, Harms MJ, Gauthier MEA, Ortlund EA, Degnan BM, Thornton JW (2010). Protein evolution by molecular tinkering: diversification of the nuclear receptor superfamily from a ligand-dependent ancestor. PLoS Biol 8(10): e1000497. Harms MJ, Thornton JW (2010). Analyzing protein structure and function using ancestral gene reconstruction. Current Opinion in Structural Biology 20:360-366. Hanson-Smith V, Thornton JW. Robustness of ancestral sequence reconstruction to phylogenetic uncertainty. Molecular Biology and Evolution, 27(9): 1988-1999, 2010. Bridgham JT, Ortlund EA, Thornton JW. An epistatic ratchet constrains the direction of glucocorticoid receptor evolution. Nature 461:515-519, 2009. Keay J, Thornton JW. Hormone-activated estrogen receptors in annelid invertebrates: implications for evolution and endocrine disruption. Endocrinology 150:1731-1738, 2009. Kolaczkowski B, Thornton JW. Long-Branch Attraction Bias and Inconsistency in Bayesian Phylogenetics. PLoS ONE 4(12): e7891,2009. Carroll SM, Bridgham JT, Thornton JW. Evolution of hormone signaling in elasmobranchs by exploitation of promiscuous receptors. Molecular Biology and Evolution 5(12):2643-52, 2008. Bridgham JT, Brown JE, Rodriguez-Mari A, Catchen JM, Thornton JW. Evolution of a new function by degenerative mutation in cephalochordate steroid receptors. PLOS Genetics 4(9): e1000191, 2008. Kolcazkowski B, Thornton JW. A mixed model of heterotachy improves phylogenetic accuracy. Molecular Biology and Evolution 25:1054-1066, 2008. Ortlund EA, Bridgham JT, Redinbo MR, Thornton JW. Crystal structure of an ancient protein: evolution by conformational epistasis. Science 317:1544-1548, 2007. Kolaczkowski B, Thornton, JW. Effect of branch length uncertainty on posterior probabilities for phylogenetic hypotheses. Molecular Biology and Evolution 24:2108-2118, 2007. Fox JE, Bridgham JT, Bovee TFH, Thornton JW. An evolvable oestrogen receptor activity sensor: development of a modular system for integrating multiple genes into the yeast genome. Yeast 24:379-390, 2007. Kolaczkowski B, Thornton, JW. Is there a star-tree paradox? Molecular Biology and Evolution, 23:1819-1823, 2007. Thornton JW. What should we do about endocrine disruption? In: A. Gore, ed. Endocrine-disrupting Chemicals: From Basic Research to Clinical Practice. Humana Press, 2007. Keay J, Bridgham JT, Thornton JW. The Octopus vulgaris estrogen receptor is a constitutive transcriptional activator: evolutionary and functional implications. Endocrinology 147:3861-3869, 2006. Thornton JW, Bridgham JT. Using ancestral gene resurrection to understand the evolution of protein function. In: Liberles DA, ed. Ancestral Gene Reconstruction. Oxford University Press, in press, 2006. Bridgham JB, Carroll SM. Thornton JW. Evolution of hormone-receptor complexity by Molecular Exploitation. Science 312:87-101, 2006. Supplementary info. Thornton JW. Evolution of gene families. In: Evolutionary Genetics: Concepts and Case Studies, ed. C. Fox and J. Wolf. Oxford University Press, 2006. Thornton JW, Kolaczkowski B. No magic pill for phylgoenetic error. Trends in Genetics 21:310-311, 2005. Krylova IN, Sablin EP, Moore J, Xy RX, Waitt GM, Juzumiene D, Bynum JM, Montana V, Lebedeva L, McKay JA, Suzuwa M, Williams JD, Williams SP, Guy RK, Thornton JW, Fletterick RJ, Willson TM, Ingraham HA. Structural analyses of NR5 orphan receptors reveal a potential role as nuclear phosphatidyl inositol sensors. Cell 120:343-355, 2005. Kolaczkowski B, Thornton JW. Performance of maximum parsimony and likelihood phylogenetics when evolution is heterogeneous. Nature 431:980-984, 2004. Thornton JW. Resurrecting ancient genes: experimental analysis of extinct molecules. Nature Reviews Genetics 5:366-375, 2004. Thornton JW, Need E, Crews D. Resurrecting the ancestral steroid receptor: ancient origin of estrogen signaling. Science 301:1714-1717, 2003. Wilson VS, Cardon MC, Thornton JW, Korte JJ, Ankley GT, Welch J, Hartig PC. Cloning and in vitro expression and characterization of the androgen receptor and isolation of estrogen receptor from the fathead minnow (Pimephales promelas). Environmental Science and Technology 38:6314-21, 2004. Wu KH, Tobias MT, Thornton JW, Kelley DB. Estrogen receptors in Xenopus: Duplicate genes, splice variants, and tissue-specific expression. General and Comparative Endocrinology 133:38-49, 2003. Thornton JW. Nuclear receptor diversity: phylogeny, evolution and endocrine disruption. Pure and Applied Chemistry 75:1827-1839, 2003. Thornton JW. A precautionary approach to assessing and managing endocrine disrupting chemicals. In: Science and the Precautionary Principle, ed. J. Tickner, Island Press, 2003. Sarkar IN*, Thornton JW*, Planet PJ, Figurski D, Schierwater B, DeSalle R. An automated phylogenetic key for classifying homeoboxes. Molecular Phylogenetics and Evolution 24: 388-399, 2002 (* equal contributors). Thornton JW, DeSalle R. Gene family phylogenetics: tracing protein evolution on trees. Experientia Supplementum (EXS) 92:191-207, 2002. Thornton JW. Gene family phylogenetics: tracing protein evolution on trees. In: Techniques in Molecular Systematics, eds. DeSalle R, Giribet G, Wheeler W. Birkauser-Verlag, 2002. Thornton JW, McCally M, Houlihan J. Biomonitoring of industrial pollutants: health and policy implications of the chemical body burden. Public Health Reports 117:315-23, 2002. Thornton J, McCally M, Howard J. Body burdens of industrial chemicals in the general human population. In: Life Support: The Environment and Public Health ed. M. McCally, MIT Press, 2002. Thornton JW. Evolution of vertebrate steroid receptors from an ancestral estrogen receptor by ligand exploitation and serial genome expansions. Proceedings of the National Academy of Sciences USA 98 (10), 5671-5676, 2001. Thornton JW. Implementing green chemistry: an environmental policy for sustainability. Pure and Applied Chemistry 73:1231-1236, 2001. Thornton JW, DeSalle R. A new test to localize and test the significance of incongruence: detecting domain shuffling in the nuclear receptor superfamily. Systematic Biology, 49:183-201, 2000. Hawkins MB, Thornton JW, Crews D, Skipper JK, Dotte A, Thomas P. Identification of a third distinct estrogen receptor and reclassification of estrogen receptors in teleosts. Proceedings of the National Academy of Sciences USA, 97: 10751-10756, 2000. Thornton JW, DeSalle R. Phylogenetics meets genomics: homology and evolution in gene families. Annual Review of Genomics and Human Genetics 1:43-72, 2000. Thornton JW. Beyond risk: an ecological paradigm for persistent organic pollutants. International Journal of Occupational and Environmental Health 6:318-330, 2000. Thornton JW, Kelley DB. Evolution of the androgen receptor: structure-function implications. BioEssays 20:820-829, 1998. Thornton J, McCally M, Orris P, Weinberg J. Hospitals and plastics: dioxin prevention and medical waste incineration. Public Health Reports 111:298-313, 1996.